Games that people play in the virtual world give Cuihua "Cindy" Shen a unique—and very big—window into human behavior. Shen, an assistant professor of communication, sifts through terabytes of data from massively multiplayer online games like EverQuest II to study a wide range of social interactions, including networking, team performance, trust-building and economic transactions, and their real-world effects on people’s lives. While surveys provide snapshots in time of people’s attitudes and experiences, Shen’s analysis of gaming data is more akin to making a series of epic movies. The data from game companies shows players’ behavior by the millisecond. “It gives us an unprecedented scale of data for an entire population of players,” Shen says. Her research, which also uses in-game surveys of players, is dispelling popular perceptions about gamers as misfit loners, refining notions of the ideal compositions of productive teams, and debunking the gender performance gap in online games. Spending hours playing online games with family and friends can actually enhance their social interactions. “It’s not just how much you play but who you play with that’s important,” she says. Closeness among team members improves a group’s performance—but only up to a point, with a mix of known associates and strangers being optimum. Female players, who are outnumbered four to one among regular players, perform equally as well and progress at least as fast as male gamers when their difference in playing time is taken into account. Shen became interested in virtual communities the same way that many other people do — playing video games as a teenager. 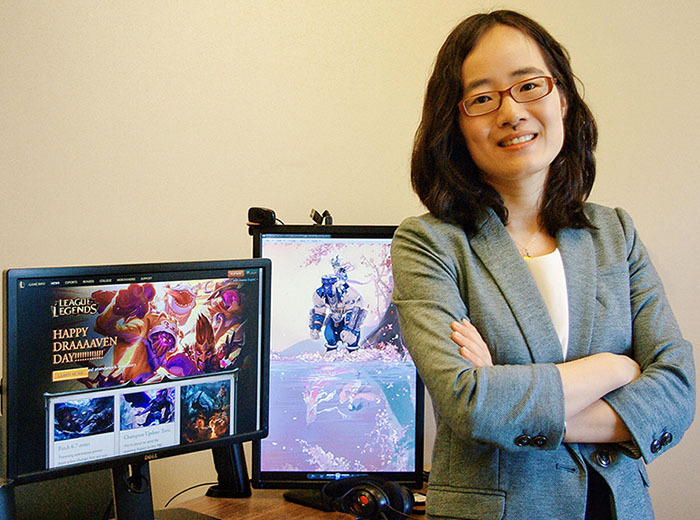 As a high school student in Suzhou, China, and as an undergraduate studying English literature and information systems at Zhejiang University in Hangzhou, China, she joined multiplayer games on local networks. As a doctoral student at the Annenberg School for Communication and Journalism at the University of Southern California, she made online gaming communities the focus of her research. She earned her Ph.D. there in 2010. It was during her graduate studies in 2007 that she and her collaborators began collecting and analyzing big data from game companies. “They were sitting on huge databases, but they didn’t know what to do with them at that time,” Shen says. For the social scientist, the data from Sony’s EverQuest II and the Chinese firm KingSoft’s Chevaliers’ Romance 3 (CR3) were mother lodes. When she joined the UC Davis Department of Communication faculty in 2014, after four years as an assistant professor at the University of Texas at Dallas, she brought four terabytes of data with her. So far, her research findings have been reported in nearly 20 journal articles, chapters in four other books and numerous conference presentations. She also co-edited the book, "Predicting Real World Behaviors from Virtual World Data." Using player IDs, Shen then matches survey answers with game behaviors. “To protect the privacy of the users, we do not have access to their real identities, only anonymized records." In another line of research, funded by the National Science Foundation, Shen is investigating how people evaluate the credibility of images in social media.